Read the entire Supplementary Appeal and access the Latest Updates on the Syria Situation. Between January and July 2017, over 600,000 IDPs and 26,300 refugees have reportedly returned spontaneously to their homes in the Syrian Arab Republic (Syria). Given this notable trend, UNHCR is scaling up its operational capacity inside Syria to better respond to the needs of those returning home, and to improve conditions in return areas for future large-scale refugee returns. 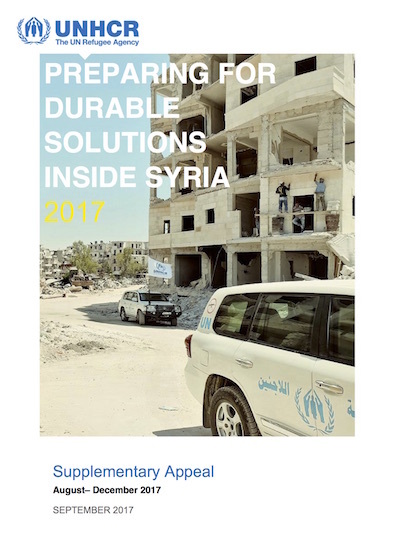 UNHCR has therefore revised its 2017 financial requirements and operational response inside Syria, as outlined in this Supplementary Appeal. As part of the overall UN response inside Syria, the Office will expand its humanitarian and protection response to monitor return movements, improve shelter conditions, and assist in the rehabilitation of social infrastructure and basic essential services, all in close coordination with respective sector lead agencies and partners. In countries of asylum, the Regional Refugee and Resilience Plan (3RP) continues to be the main regional coordination and planning tool to address the protection and resilience needs of Syrian refugees, covering Egypt, Lebanon, Iraq, Jordan and Turkey.